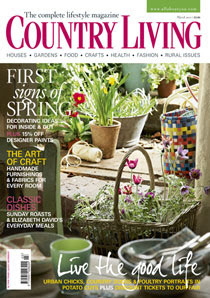 I used to be a real magazine junkie but I have now got it down to just one or two per month but one of my absolute faves is Country Living Magazine. Now obviously this is a lifestyle magazine and one to which I so totally aspire, if only I had the time, money and the expertise to undertake the jam-making, crafting, decorating, enjoying nature, defeating my garden but as there are only 24 hours in a day I have to admit defeat and live it vicariously through the pages of this magazine. Although one day I might have a beehive and not the one on top of my head! Now the category I like the look of is the crafts category - I will need to find three items, take pics, explain how they are made and then write a 500 word description of what your do, how you started and your future dreams. I am now trying to find original designs, decide what I should enter and what my dreams are. So which category would you enter and what would be your three original makes? Personally, I'd probably go with the "best cook" and submit my family pie recipe. The reason it's so grand? It's not full of the hype for things. It's an old-school recipe using real butter and sugar and real eggs and actual ingredients, instead of this low-carb/sugar substitute garbage. I know some people like that...but it doesn't taste right if you don't use the real stuff. Renee Anne - we need the recipe! One of my fave desserts contains over a pint of cream... and it the yummiest creation ever. My mother learnt how to make it many years ago when she was in service, she asked the cook for the recipe and the cook would not share it and told her, "It's a secret!" My mum was really disappointed but one day when she was washing up in the scullery she had a cupboard door open and the cupboards all had mirror fronts and the angle of the door reflected the cook making the dessert, so my mother watched her work. When the cook had finished she dashed off and wrote down what she had seen and after a little bit of trial and error she perfected it. And no, sorry I cannot share - it's a family secret!